There have not been too many low moments for them this season as they have powered to the top of the Evo-Stik South League East. They are certainly the title favourites and currently hold a five-point advantage over second-placed Beaconsfield Town who have also played a game more. It would make their trip to Barton look like something of a formality as the home side sit second from bottom and have collected only five wins all term. 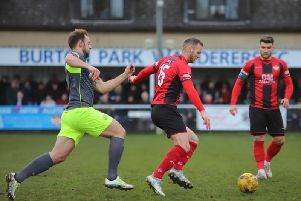 But it is under two weeks since Diamonds’ 17-game unbeaten run was brought to an end by mid-table Egham who came into the game on the back of six straight league defeats – and that upset is something Peaks wants his players to bear in mind. “We set high standards here and we didn’t hit them against Egham,” the boss explained. “I want what happened there to be our yardstick – we can’t let that happen again. “Barton Rovers are at the wrong end of the table but they recently beat Marlow 4-0 and we could only get a draw there. “They’ve also got a couple of ex-Diamonds in their team who will want to win against us. “I hope that the Egham result will do us good things. “I want it to be a warning that we have to match every side’s ethics and work rate in every game. “We have 12 massive games coming up with probably four of the top five still to play. “In many ways the big games take care of themselves. “It is critical that we beat the teams like Barton. “We’ve got Dunstable coming up who are in fourth but, I know it’s a cliche, I’m always taking it one game at a time. Diamonds bounced back from their Egham reverse by wallopping Thame United 6-0 in midweek. And, while that match got the side back on track, its emphatic nature also enabled Peaks to look after a few of his personnel as well. “I took a couple off and gave some who needed a few minutes their chance so it was good,” Peaks added. “Tom Lorraine is coming back from injury so I got him off and the same with Ben Farrell. Ben Diamond will be a doubt for this weekend but we’ll have a look at him at training and see how he is shaping up."